Extract, transform, and load (ETL) operations collectively form the backbone of any modern enterprise data lake. It transforms raw data into useful datasets and, ultimately, into actionable insight. An ETL job typically reads data from one or more data sources, applies various transformations to the data, and then writes the results to a target where data is ready for consumption. The sources and targets of an ETL job could be relational databases in Amazon Relational Database Service (Amazon RDS) or on-premises, a data warehouse such as Amazon Redshift, or object storage such as Amazon Simple Storage Service (Amazon S3) buckets. Amazon S3 as a target is especially commonplace in the context of building a data lake in AWS. AWS offers AWS Glue, which is a service that helps author and deploy ETL jobs. AWS Glue is a fully managed extract, transform, and load service that makes it easy for customers to prepare and load their data for analytics. Other AWS Services also can be used to implement and manage ETL jobs. They include: AWS Database Migration Service (AWS DMS), Amazon EMR (using the Steps API), and even Amazon Athena. How can we orchestrate an ETL workflow that involves a diverse set of ETL technologies? AWS Glue, AWS DMS, Amazon EMR, and other services support Amazon CloudWatch Events, which we could use to chain ETL jobs together. Amazon S3, the central data lake store, also supports CloudWatch Events. But relying on CloudWatch Events alone means that there’s no single visual representation of the ETL workflow. Also, tracing the overall ETL workflow’s execution status and handling error scenarios can become a challenge. In this post, I show you how to use AWS Step Functions and AWS Lambda for orchestrating multiple ETL jobs involving a diverse set of technologies in an arbitrarily-complex ETL workflow. AWS Step Functions is a web service that enables you to coordinate the components of distributed applications and microservices using visual workflows. You build applications from individual components. Each component performs a discrete function, or task, allowing you to scale and change applications quickly. Let’s look at an example ETL workflow. For our example, we’ll use two publicly available Amazon QuickSight datasets. A date, potentially when an opportunity was identified. A market segment to which the opportunity belongs. The second dataset is an online marketing metrics dataset. This dataset contains records of marketing metrics, aggregated by day. The metrics describe user engagement across various channels, such as websites, mobile, and social media, plus other marketing metrics. The two datasets are unrelated, but for the purpose of this example we’ll assume that they are related. Imagine there’s a business user who needs to answer questions based on both datasets. Perhaps the user wants to explore the correlations between online user engagement metrics on the one hand, and forecasted sales revenue and opportunities generated on the other hand. The user engagement metrics include website visits, mobile users, and desktop users. 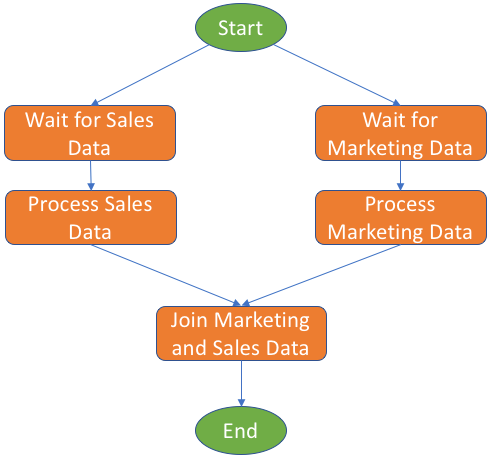 Process the Sales dataset (PSD). Read the Sales dataset. Group records by day, aggregating the Forecasted Monthly Revenue field. Rename fields to replace white space with underscores. Output the intermediary results to Amazon S3 in compressed Parquet format. Overwrite any previous output. 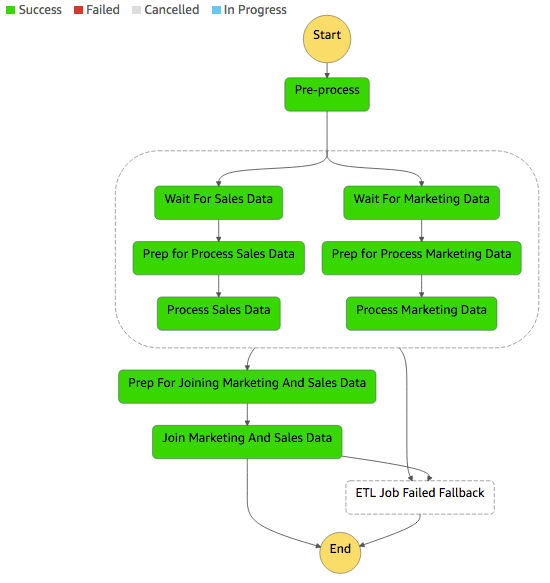 Process the Marketing dataset (PMD). Read the Marketing dataset. Rename fields to replace white space with underscores. Send the intermediary results to Amazon S3 in compressed Parquet format. Overwrite any previous output. Join Marketing and Sales datasets (JMSD). Read the output of the processed Sales and Marketing datasets. Perform an inner join of both datasets on the date field. Sort in ascending order by date. Send the final joined dataset to Amazon S3, and overwrite any previous output. Both Sales and Marketing datasets are uploaded to an S3 bucket at random times in an interval of up to a week. The PSD job should start as soon as the Sales dataset file is uploaded. The PMD job should start as soon as the Marketing dataset file is uploaded. Parallel ETL jobs can start and finish anytime, but the final JMSD job can start only after all parallel ETL jobs are complete. In addition to PSD and PMD jobs, the orchestration must support more parallel ETL jobs in the future that contribute to the final dataset aggregated by the JMSD job. The additional ETL jobs could be managed by AWS services, such as AWS Database Migration Service, Amazon EMR, Amazon Athena or other non-AWS services. The data engineer takes these requirements and builds the following ETL workflow chart. To fulfill the requirements, we need a generic ETL orchestration solution. A serverless solution is even better. Let’s see how we can orchestrate an ETL workflow to fulfill the requirements using AWS Step Functions and AWS Lambda. The following diagram shows the ETL orchestration architecture and the main flow of events. The main flow of events starts with an AWS Step Functions state machine. This state machine defines the steps in the orchestrated ETL workflow. A state machine can be triggered through Amazon CloudWatch based on a schedule, through the AWS Command Line Interface (AWS CLI), or using the various AWS SDKs in an AWS Lambda function or some other execution environment. As the state machine execution progresses, it invokes the ETL jobs. As shown in the diagram, the invocation happens indirectly through intermediary AWS Lambda functions that you author and set up in your account. We’ll call this type of function an ETL Runner. While the architecture in the diagram shows Amazon Athena, Amazon EMR, and AWS Glue, the accompanying code sample (aws-etl-orchestrator) includes a single ETL Runner, labeled AWS Glue Runner Function in the diagram. You can use this ETL Runner to orchestrate AWS Glue jobs. You can also follow the pattern and implement more ETL Runners to orchestrate other AWS services or non-AWS tools. ETL Runners are invoked by activity tasks in Step Functions. Because of the way AWS Step Functions’ activity tasks work, ETL Runners need to periodically poll the AWS Step Functions state machine for tasks. The state machine responds by providing a Task object. The Task object contains inputs which enable an ETL Runner to run an ETL job. As soon as an ETL Runner receives a task, it starts the respective ETL job. An ETL Runner maintains a state of active jobs in an Amazon DynamoDB table. Periodically, the ETL Runner checks the status of active jobs. When an active ETL job completes, the ETL Runners notifies the AWS Step Functions state machine. This allows the ETL workflow in AWS Step Functions to proceed to the next step. An important question may come up. Why does an ETL Runner run independently from your Step Functions state machine and poll for tasks? Can’t we instead directly invoke an AWS Lambda function from the Step Functions state machine? Then can’t we have that function start and monitor an ETL job until it completes? The answer is that AWS Lambda functions have a maximum execution duration per request of 300 seconds, or 5 minutes. For more information, see AWS Lambda Limits. ETL jobs typically take more than 5 minutes to complete. If an ETL Runner function is invoked directly, it will likely time out before the ETL job completes. Thus, we follow the long-running worker approach with activity tasks. The worker in this code sample – the ETL Runner – is an AWS Lambda function that gets triggered on a schedule using CloudWatch Events. If you want to avoid managing the polling schedule through CloudWatch Events, you can implement a polling loop in your ETL workflow’s state machine. Check the AWS Big Data blog post Orchestrate Apache Spark applications using AWS Step Functions and Apache Livy for an example. Finally, let’s discuss how we fulfill the requirement of waiting for Sales and Marketing datasets to arrive in an S3 bucket at random times. We implement these waits as two separate activity tasks: Wait for Sales Data and Wait for Marketing Data. A state machine halts execution when it encounters either of these activity tasks. A CloudWatch Events event handler is then configured on an Amazon S3 bucket, so that when Sales or Marketing dataset files are uploaded to the bucket, Amazon S3 invokes an AWS Lambda function. The Lambda function then signals the waiting state machine to exit the activity task corresponding to the uploaded dataset. The subsequent ETL job is then invoked by the state machine. Model the ETL orchestration workflow in AWS Step Functions. Use AWS Step Functions to model the ETL workflow described in this post as a state machine. A state machine in Step Functions consists of a set of states and the transitions between these states. A state machine is defined in Amazon States Language, which is a JSON-based notation. For a few examples of state machine definitions, see Sample Projects. The following snapshot from the AWS Step Functions console shows our example ETL workflow modeled as a state machine. This workflow is what we provide you in the code sample. 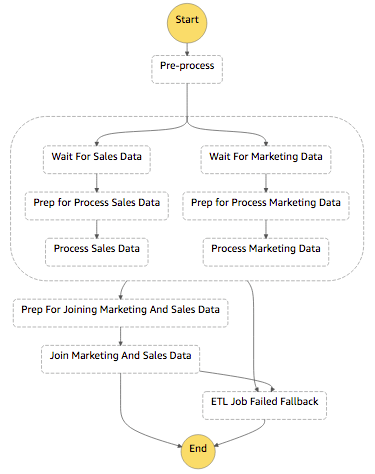 When you start an execution of this state machine, it will branch to run two ETL jobs in parallel: Process Sales Data (PSD) and Process Marketing Data (PMD). But, according to the requirements, both ETL jobs should not start until their respective datasets are uploaded to Amazon S3. Hence, we implement Wait activity tasks before both PSD and PMD. When a dataset file is uploaded to Amazon S3, this triggers an AWS Lambda function that notifies the state machine to exit the Wait states. When both PMD and PSD jobs are successful, the JMSD job runs to produce the final dataset. Finally, to have this ETL workflow execute once per week, you will need to configure a state machine execution to start once per week using a CloudWatch Event. Build your ETL Runners (or use an existing AWS Glue ETL Runner). The code sample includes an AWS Glue ETL Runner. For simplicity, we implemented the ETL workflow using only AWS Glue jobs. However, nothing prevents you from using a different ETL technology to implement PMD or PSD jobs. You’ll need to build an ETL Runner for the technology that follows the AWS Glue ETL Runner example. A template responsible for setting up AWS Glue resources.For our example ETL workflow, the sample template creates three AWS Glue jobs: PSD, PMD, and JMSD. The scripts for these jobs are pulled by AWS CloudFormation from an Amazon S3 bucket that you own. A template where the AWS Step Functions state machine is defined.The state machine definition in Amazon States Language is embedded in a StateMachine resource within the Step Functions template. A template that sets up resources required by the ETL Runner for AWS Glue.The AWS Glue ETL Runner is a Python script that is written to be run as an AWS Lambda function. Invoke the ETL orchestration state machine. Finally, it is time to start a new state machine execution in AWS Step Functions. For our ETL example, the AWS CloudFormation template creates a state machine named MarketingAndSalesETLOrchestrator. You can start an execution from the AWS Step Functions console, or through an AWS CLI command. When you start an execution, the state machine will immediately enter Wait for Data states, waiting for datasets to be uploaded to Amazon S3. Upload datasets provided to the S3 bucket that you specified in the code sample configuration. This uploaded datasets signal the state machine to continue execution. The state machine may take a while to complete execution. You can monitor progress in the AWS Step Functions console. If the execution is successful, the output shown in the following diagram appears. Congratulations! You’ve orchestrated the example ETL workflow to a successful completion. What if a job in the ETL workflow fails? In such a case, there are error-handling strategies available to the ETL workflow developer, from simply notifying an administrator, to fully undoing the effects of the previous jobs through compensating ETL jobs. Detecting and responding to a failed ETL job can be implemented using the AWS Step Functions’ Catch mechanism. For more information, see Handling Error Conditions Using a State Machine. In the sample state machine, errors are handled by a do-nothing Pass state. Try it out. Stop any of the example ETL workflow’s jobs while executing through the AWS Glue console or the AWS CLI. You’ll notice the state machine transitioning to the ETL Job Failed Fallback state. In this post, I showed you how to implement your ETL logic as an orchestrated workflow. I presented a serverless solution for ETL orchestration that allows you to control ETL job execution using AWS Step Functions and AWS Lambda. You can use the concepts and the code described in this post to build arbitrarily complex ETL state machines. For more information and to download the source code, see the aws-etl-orchestrator GitHub repository. If you have questions about this post, send them our way in the Comments section below. If you found this post useful, be sure to check out Build a Data Lake Foundation with AWS Glue and Amazon S3 and Orchestrate Apache Spark applications using AWS Step Functions and Apache Livy. Moataz Anany is a senior solutions architect with AWS. He enjoys partnering with customers to help them leverage AWS and the cloud in creative ways. He dedicates most of his spare time to his wife and little ones. The rest is spent building and breaking things in side projects.